How to use the Customers Page in Vend – How can we help? Vend's customer page allows you to create and manage customers and track your customers activity in your store. From this screen you can import and add customers, search for specific customers and groups, view a list of the customers in your store and review an individual customer's profile, contact info and store balances. In Vend, you can individually add a customer or import customers in bulk using a CSV. Both of these actions can be accessed from the customers page. For details on how to add a single customer, check out this article. For more information on how to bulk import customers, click here. In the customer screen, you can choose to search for a specific customer or filter down your customer list. To search for a specific customer, type in their name, customer code or contact details (such as email address or phone number) in the search field and click search. This is will bring up the customer with an expanded view. To view or edit details of a certain customer, including their profile, contact info and store balance, click on the customer's line in your customer list. This will open an expanded view where you can review the customer's info, pay off outstanding balances, view sales made to this customer, edit the customer's details and delete the customer from your database. 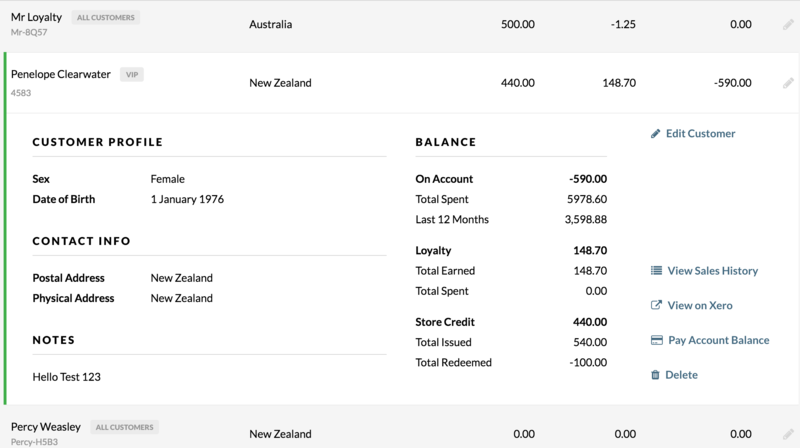 If this customer is linked to your Xero account, you can also use this view to access their Xero customer record. Tip: You can also bring up the expanded view of a customer by searching for them.